Welcome to Mastech Machinery, Manufacturer and Supplier of Tablet Press Accessories and Granulation Machines. The company was incepted in 2011 at Ahmedabad. Sound financial position and Cutting edge technology make us different from others. Dimensional accurate products, Corrosion and abrasion resistance make us the first choice of our clients. We offer a splendid range of Tablet Hardness Testers, Counter and Press Machines. Our Granulating, Drying and Mixing Machines are best in the industry amongst others. We offer Filling, Burning and Coating Machines that are in huge demand across the global markets. Blister Packing Machine and Size Reduction Equipment offered by us are acknowledged for their functionality. Along with that we offer Filter Press and Electrical Mills that are superior in performance. 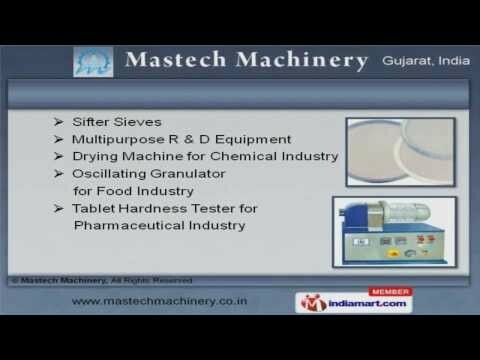 We also provide Sifter Sieves and Tablet Hardness Tester for Pharmaceutical Industry that are a class apart.